QTY 12345678910111213141516171819202122232425262728293031323334353637383940414243444546474849505152535455565758 Please select a quantity. This enticing functional cabinet is interestingly a beautiful addition to give any theme interior a classic look. Sturdy wood constructed hallway cabinet consisting one double door cabinet with easy metal handles and one bottom shelf for storage. Featuring a light brown finish, this inspiring design is a lovely addition for aesthetic looking homes. It offers perfect storage space and one shelf for holding decoration accents. 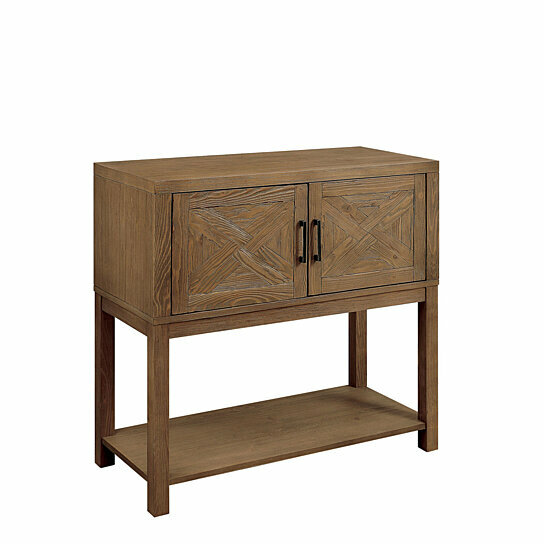 This hallway furniture piece is perfect to give warmth to an entryway, living room or bedroom.